In the spirit of the Sydney Opera House, Paris' Eiffel Tower, the St. Louis Gateway Arch and even the Washington Monument, the iconic guitar hotel tower under construction at Seminole Hard Rock Hotel & Casino, Hollywood is soon to become one of the world's most recognized landmarks. It is the flagship destination of the Hard Rock International empire owned by the Seminole Tribe of Florida. The giant guitar tower will be the centerpiece of one of the world's most elaborate casino complexes, including a Hard Rock Casino nearly double its current size with 3,267 slot machines and 178 table games such as blackjack and baccarat, plus a new 18,000-square foot poker room. The expansion will also include 60,000 square feet of new retail and restaurant space and a $100 million redesigned and completely rebuilt Hard Rock Live venue with 7,000 seats in a theater-style configuration. The expansion of Seminole Hard Rock Hotel & Casino will open in mid-2019, in advance of Super Bowl LIV at nearby Hard Rock Stadium in February 2020. Leaders of the Seminole Tribe of Florida and Seminole Gaming, who own and operate the casino complex, gathered today on the expansion site to celebrate its construction progress with a traditional Hard Rock "Guitar Smash" ceremony and community event. "Our ancestors and elders welcomed curious tourists to our Florida reservations, and today's members of the Seminole Tribe of Florida will soon welcome visitors from all over the world to what will become a landmark destination," Seminole Tribe Chairman Marcellus Osceola Jr. said. "Our guitar tower will attract global attention." 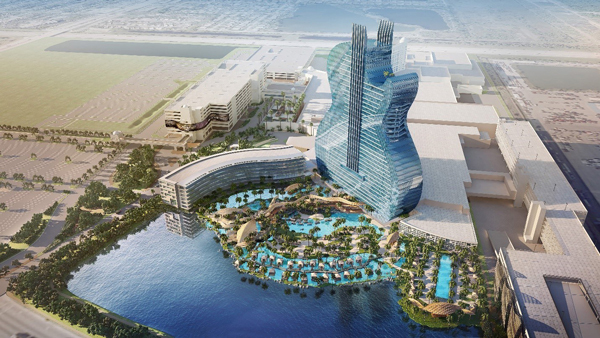 The iconic guitar hotel structure is the vision of James F. Allen, longtime CEO of Seminole Gaming and Chairman of Hard Rock International. Allen is working closely with Las Vegas-based Klai Juba Wald Architects and other world-renowned firms to turn his vision into reality. Other firms involved in designing and furnishing the expansion project are Rockwell Group, New York; EDSA, Fort Lauderdale; Wilson Associates, Dallas; Wimberly Interiors, Coral Gables; Cleo Design, Las Vegas; and Laurence Lee Associates, Los Angeles. Suffolk-Yates is constructing the expansion. "Our talented team of architects and designers have done an amazing job of designing this incredible structure and working to bring it to life," Allen said. "But it's our team of dedicated employees and managers at Seminole Gaming who really deserve the credit. They are responsible for the ongoing success of the Seminole Hard Rock Hotel & Casino by helping to lay the foundation to make this expansion project possible." The expansion will include 806 additional guestrooms and suites, with 638 in the iconic guitar hotel tower, where all guestrooms will be 525 square feet or larger. An additional 168 guestrooms and suites will be located in a 7-story Pool Tower that will flank the pool complex. It will bring the total number of guestrooms and suites at the Seminole Hard Rock Hollywood to more than 1,300. Other amenities will include restaurants, lounges, a business center and a 41,000-square foot spa. At the base of the guitar tower will be an elaborate 10-acre pool complex highlighted by the "Bora Bora Experience," with private villas surrounded entirely by water and waterfalls. The villas will offer luxury accommodations with private plunge pools and butler service. Chickee-cabanas will dot the banks of the lagoon-style resort pool, which will also include beach club dining and guest activity options including canoes and paddleboats. Walls of multi-level waterfalls will greet guests as they stroll through an outdoor water wonderland. The popular 5,500-seat Hard Rock Live arena will be razed in March 2018, and replaced with a state-of-the-art 7,000-seat Hard Rock Live in a theater-style configuration. Designed by Montreal-based Sceno Plus, one of the world's leading designers of theatrical venues, the new Hard Rock Live will house its own television studio and broadcast center to produce and televise awards shows and other events. It will also open in mid-2019. In the interim, a full schedule of concerts, comedy shows and other events will take place in a newly constructed venue in the northwest corner of the Seminole Hard Rock site, adjacent to the existing poker room and meeting facilities. Once the new Hard Rock Live venue opens, the temporary performance hall will become a 37,000-square foot ballroom. It will more than triple the amount of meeting space at the Seminole Hard Rock complex, offering a grand total of 141,000 square feet of meeting space in a new Seminole Hard Rock Conference Center.